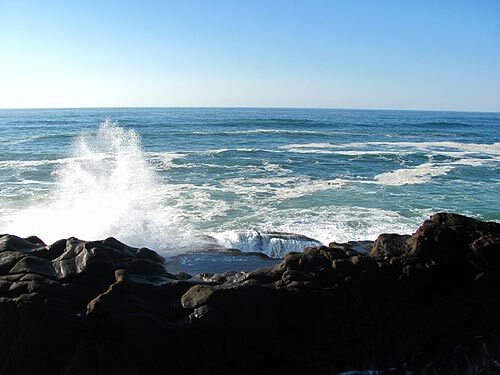 (Depoe Bay, Oregon) â€“ First there is the headland and its park with the name Boiler Bay â€“ a state park, to be exact. 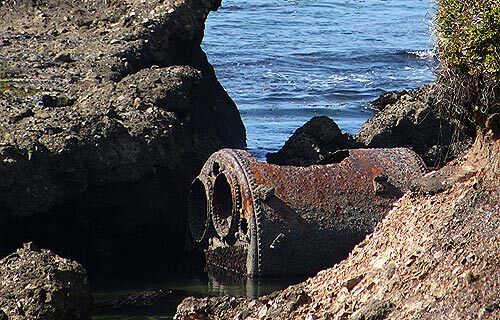 Then there is Boiler Bay with the remnant of an ancient shipwreck. And then, well, then there appears to be even more to the place. Some of it is quite secretive and exclusive. Boiler Bay State Park, at the edge of Depoe Bay, is an interesting and maybe even slightly confusing spot along the central Oregon coast. Powerfully scenic, with equally powerful waves rumbling past, there's more to this awe-inspiring spot than meets the eye. The small headland that juts out from the northern edge of Depoe Bay is the one with Boiler Bay signage on it. 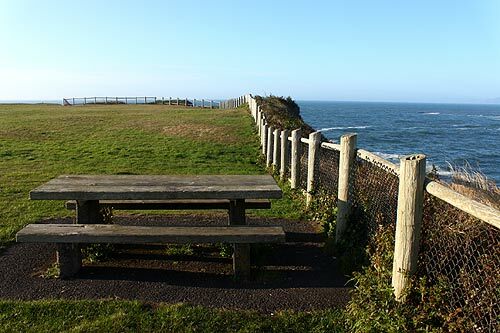 Restrooms, picnic tables and plenty of stunning views abound here. A nice, long grassy area provides a slightly pastoral experience as you take in the ocean air, and maybe walk your dog a tad. 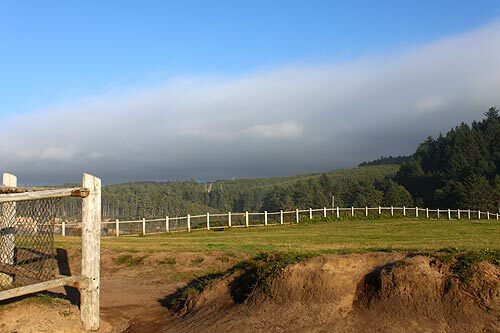 Lined with a rather pleasant-looking fence, you can lean over just a bit and take in a tiny splash of ocean mist on your face from these fairly rambunctious waves. This is more than part of the pleasure of the place. Take a look straight out westward and watch the waves smack the basalt rocks, sometimes with furious chaos. They can really fire into the air here. 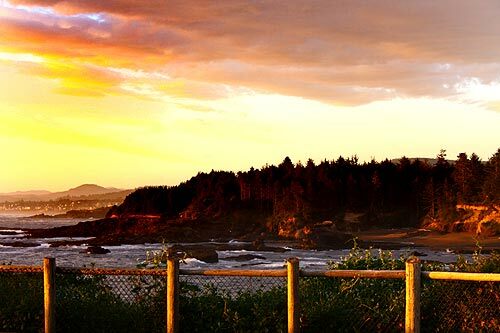 Look southward and soak up the sights of Depoe Bay as more waves slam into the rocks on the headland's southern face. Some of these tidal monsters can be the real show. Point yourself to the north and that is Boiler Bay â€“ the whole bay. Much of it is a vast space full of rolling waves of varying ferocity. But chunks of the stony structures close to the headland have curious shapes: a series of bulbous blobs and knobby nooks and crannies that look just a tad alien. 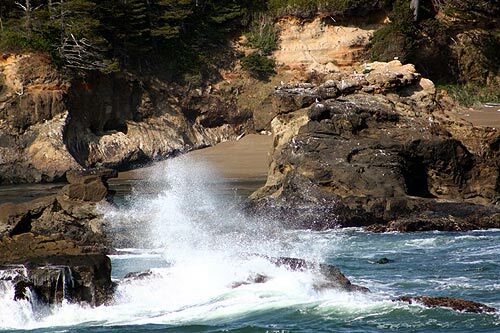 Drive about a half mile south and you'll encounter an unnamed gravel pullout that overlooks what gave Boiler Bay its moniker. An even smaller bay sits here, cloistered amidst the larger deep crescent. 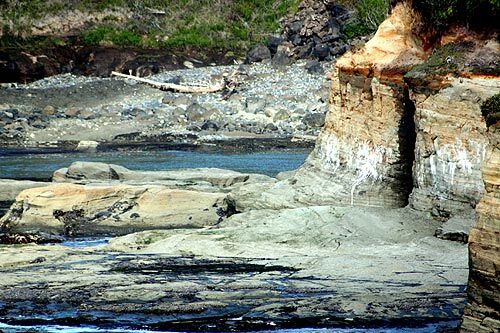 At super low tides you can see the only remnant of a shipwreck down there: the steamer J. Marhoffer that crashed and burned here in 1910. This part of the bay is plenty curious in itself, but with a slippery and slightly dangerous pathway leading down to a place you shouldn't really go. It's accessible under very calm and low tide conditions. But do not attempt to go down there, otherwise. Many have lost their lives here breaking some very obvious rules. Other, slightly more mysterious areas lay at the bay's very northern edge â€“ places you apparently can't go. The only access is from a gated community just around the bend. 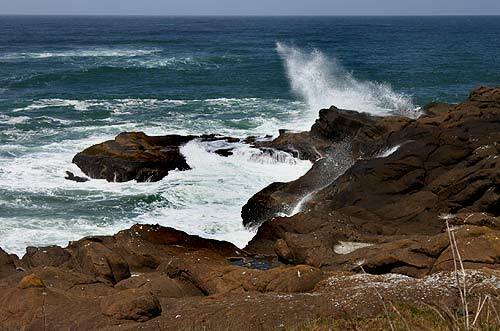 You can see much of this mesmerizing area from the main headland of Boiler Bay State Park. There are cajoling caves and other structures that defy description, along with a small beach that simply screams pirates' treasure. However, you'll have to leave it to your imagination. 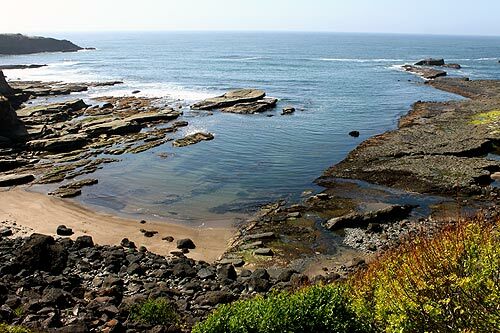 Boiler Bay State Park is at the very northern edge of the city limits of Depoe Bay. More on the area at theÂ Depoe Bay Virtual Tour, Map.